Blästa Henriët wheatbag: The perfect ethical Christmas present? 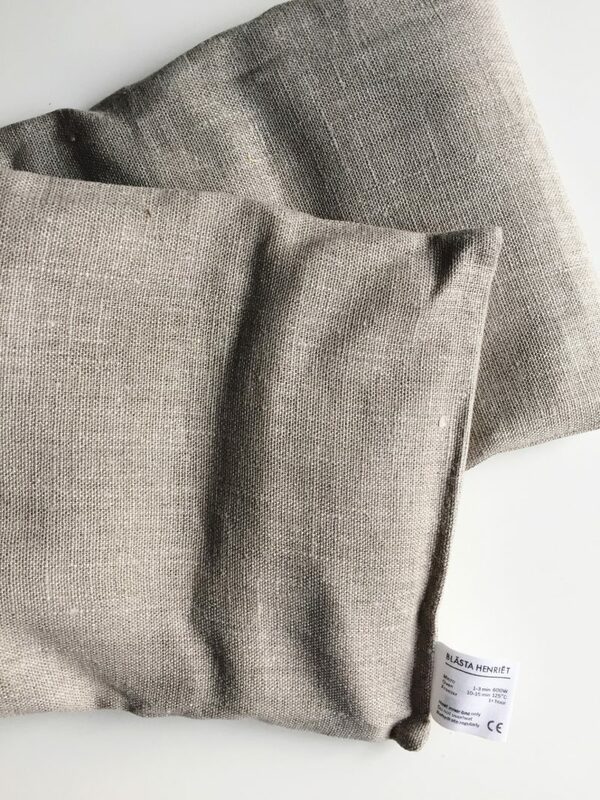 Blästa Henriët sent me a plain linen wheatbag in exchange for a review. All opinions are my own. Blästa Henriët create beautiful and useful well being products with a strong focus on Scandinavian design. Everything is made by hand in their London studio from natural resources. Currently the range includes the wheatbag and a smaller eye pillow. My wheatbag arrived a few weeks ago and I’ve been using it constantly ever since. Mine is the plain linen one but there are designs available which have been screen-printed by hand using vegetable dye. An awesome thing about linen is that it just gets softer and better with use. It has been such a welcome comfort from the endometriosis pain I suffer from. A simple rectangle divided into six sections (each filled with locally grown wheat), the design is pretty genius. It’s lengthy enough to drape around your neck, and flexible enough to wrap around joints. As the wheat stays evenly distributed, so does the heat. As well as using mine to help with pain, I have been using it just to keep myself warm; covering my shoulders when I’m sat the the computer or popping it into our bed like a hot water bottle! 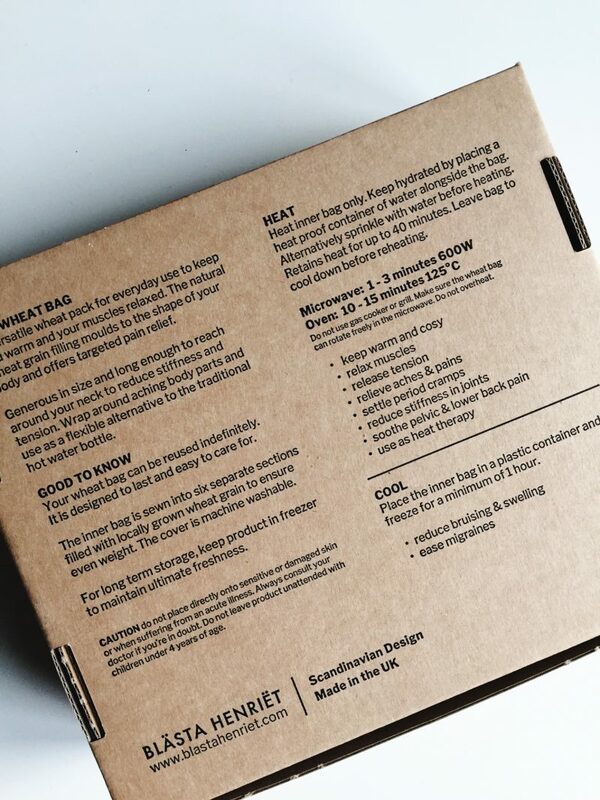 Another clever bit of design is including the heating instructions on the label. Just as well because I know I’d forget! The linen cover is removable for heating/freezing, which also means its washable; another clever idea. What is great is that the wheatbag can be heated in the oven (electric only) as well as the microwave. Not only that but it can also be frozen for providing cold relief. Very versatile and you don’t need to find out if someone has a microwave before buying one for them. The Scandinavian influence of the brand can be seen in the packaging, which is simple but attractive. All of the information the recipient of the wheatbag needs to know is printed on the back. Of course, the packaging is 100% recyclable. 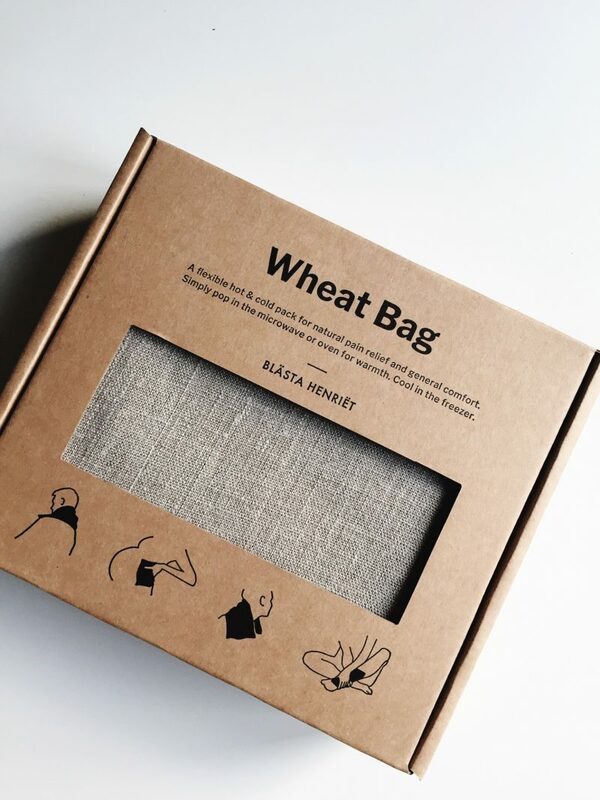 Why would a wheatbag make a good gift? I think that either a wheatbag or one of the eye pillows would make a great gift for just about anyone. Firstly, if you know anyone who suffers from regular pain; applying heat may help them to feel more comfortable. As it can be popped into the freezer, it makes it an ideal cold compress for headaches, reducing swelling or for sports-related injuries. I’m fairly sure mine will come in handy after karate! Not only is this a useful gift, but it’s indefinitely reusable which makes it more ethical. I know a lot of us feel uneasy about consumerism during the festive period, so something that can be used for years to come has to be a better choice. Essential oils: The wheatbag has an almost unnoticeable scent of wheat. It got me thinking that adding a couple of drops of essential oil would be a lovely addition. Lavender is the most obvious choice, but ylang ylang and geranium are also good for relaxation. Or how about frankincense for a festive touch? I haven’t tried this with my own wheatbag yet but I’d advise using essential oil on a separate piece of fabric tucked inside so that it doesn’t mark the cover. Embroidery: The linen cover is beautiful enough as it is, but a bit of embroidery would be a lovely way to make this a more personal gift. Particularly if you tend to prefer to give handmade gifts. I have a whole Pinterest board of embroidery if you’re looking for inspiration. Extra cover: If I were gifting a wheatbag I’d sew an extra cover for when the linen one needs washing. An excuse to use a bit of novelty fabric? Yes please! Again, a good compromise if you’d prefer to make all of your Christmas gifts. If you have any other ideas for ethical, useful Christmas gifts, please do leave me some links in the comments. I really do need to get on with my shopping! I think it would be a great gift even for people who don’t suffer regularly from pain. The thing about this type of thing is you never need it until you need it. Then it’s too late to order one in the mail. You’re left to buy some cheap plastic thing locally. Nice idea!! !